"I sort of mirror the state's decline." For those without comedic tastes, the so-called experts at Wikipedia have an article about Don Martin. Donald "Don" Martin (1931-2000) was a noted cartoonist who wielded a special influence over Baby boomers, freeing them from the confines of sobriety imposed by the World War generations. During his life Don Martin became a totally mad artist whose strange talent naturally led him into the U.S. military and a quieter atmosphere more suited to the freedom of expression he intensely craved. During World War II, Martin excelled as an Army recruiter whose famous war poster, "Who needs you?" had gung-ho farm-boys from Texas to North Dakota clamoring to die for the lost-freedom of arrogant Europeans. Martin's best-known works, however, were published in Mad Magazine between 1956 to 1988. He had two distinct styles: patently insane and totally bombastic. Both styles are especially noted for their absurd, exaggerated character formations, onomatopoeic sound effects, and blunt, moronic plot devices. Indeed, Martin was a legend in our own mind. 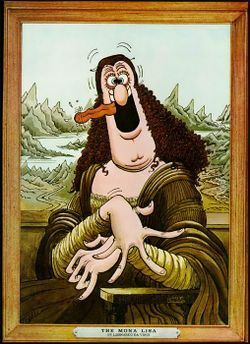 Don Martin's style eclipsed all previous masters in complete lunacy, thus earning him the title of "Mad's maddest artist." After hunting alligators in Florida with a Bee-Bee gun, letting air out of tires in Atlantic City, serving as Chairman of the Federal Reserve Board in Ponziland, stalking Tibetan cheer-leaders in Peking, and other naughty pranks during childhood, Don Martin finally got serious and studied "Wackovistic Art" at Newark's Fine Arts Convent for the Miracle Bred, from which he was promptly expelled for being a "wise guy" (too intelligent). In spite of having no formal education Martin mastered industrialized cartoon weapons design between 1941 and 1943, and it was he who first conceived of the nose trigger button for setting off an atomic bomb detonation. In 1947 Martin completed his studies at Harvard Girls Derogatory School in Winston/Salem, North Carolina. Several months of detention later Martin was finally forced to leave the school, but not before he had earned a Ph. D. in “Lunacy” - His thesis was titled, “Why Capt Klutz Outranks Major Catastrophe." Apart from WWII, Martin had a very boring life before and after taking on his role as an exceptional artist with Mad Magazine. Martin's work first appeared in Mad in September 1956. His life was so extremely boring that we have to make things up now. In fact, he grew so restless that he once bailed out of an airplane over the Burmese jungle. Finding his way home to civilization, and collecting worthless rubies on the way, he was eventually captured by cannibals. But just before the fire was lit Martin escaped, killed the tribal chief, ran off with his beautiful daughter, and crossed safely back to Laos - all the richer. Not to mention his having successfully jumped across the Grand Canyon, which was all the more remarkable in that he didn't even use a motor-cycle. See what we mean? During WWII Martin was drafted by the US Army as a recruiter/cartoonist. The most memorable is his “Who needs You?” Uncle Sam Poster - which resulted in an upsurge of new inductees as well as AWOL service personal. During the war his sordid affair with popular Japanese DJ Tokyo Rose was fodder for gossip columnists from Haiti to Alaska. A male baby was born of this treasonous union named simply “Fonebone”, a total moron with no nationality and about as subtle as a pink elephant in New York. During the bloody storming of Nagasaki when an Atomic Bomb was dropped, Martin became best friends with fellow MAD contributor Sergio Aragonés, and they both had the same dirty job, e.g., counting the living. The final tally was "0" humans, and 50 million teenage-mutant-ninja cockroaches, all the size of armadillos, who re-colonized Japan and invented waterproof mini cars with twelve horse-power engines. 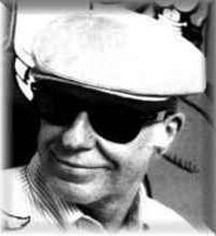 In his last years of working with Mad, Martin got MAD (lost his temper) and had a falling out with publisher Bill Gaines over recognition for the paperback compilations of older Mad articles and cartoons released under titles, like The Self-Made Mad. Gaines insisted that he had paid the cartoonist, viz., Don Martin, for the pictures and owned them. Martin did not agree, claiming at one point that he had likely lost over a trillion dollars in royalties because of this perceived "rip-off" of this work. Martin later testified before a Congressional subcommittee that his Alfred E. Neuman persona or alter-ego had, in fact, been paid for the drawings - but didn't share any of the booty with him. A moronic New York law against suing yourself stifled Martin's chances of recovering any cash. Martin left Mad in 1987, and he began cartooning for copy-Mad humor publication Cracked, which insulted its larger competitor by billing Martin as "Cracked's MADest Artist." After six years with Cracked, Martin parted company with the magazine in 1993. A year later, he launched his own short-lived publication, Don Martin Do-It-Yourself which only published two issues before Martin was abducted. While visiting Roswell, New Mexico, Don Martin was mysteriously abducted by aliens, during broad-daylight, in 2000 at age 68. And he has not been heard from since. When witnesses told Roswell police about the abduction, they responded by asking, "So, what else is new?" Speculations that he was reborn in Uganda and adopted by Madonna are impossible to prove, persistent though they are. Typical example of a Don Martin cartoon plot. Martin's immediately recognizable drawing style (which featured normal looking people) was filled with boring innuendo. His inspirations and themes were often quite ordinary. But his style evolved, settling into its familiar form by 1964. His work probably reached its lowest point in the late 1960s and early 1970s. In later years, particularly during the 1980s, he let other people write most of his gags, most notably Sergio Aragonés. Martin's cartoons always involved complex plots and were considered highly intellectual. For example, one fine day a man is standing in a park when he notices a small round shadow on the ground at his feet, the round shadow grows larger and larger and larger, so he looks up to see a huge atomic bomb, with fuse protruding from the nose, just a micro-second away from landing directly on his head. When it came to spinning a tale Martin always got right to the point. Although most of Martin's cartoons, which often have titles like, "One Fine Day At The Park" have unnamed characters. Still a few of his heroes had names and were prominent in his works. These are: 1) Fonebone, 2) Fester Bestertester, 3) Capt. Klutz, 4) Maj. Catastrophe, 5) Biff Boffo, 6) Karbuncle, and 7) King Witz. Their collective importance in world culture cannot and should never be overestimated. 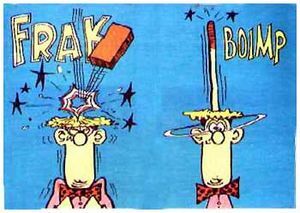 Don Martin was little known for his use of self-composed effects to describe different sounds in his cartoon plots. Following are a few of the onomatopoeic sounds from the actual Don Martin Dictionary. 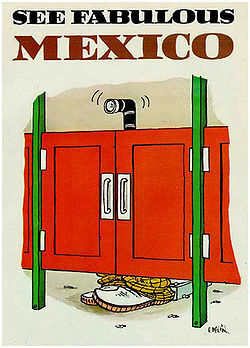 Don Martin created this advertisement for Mexico's tourism industry. 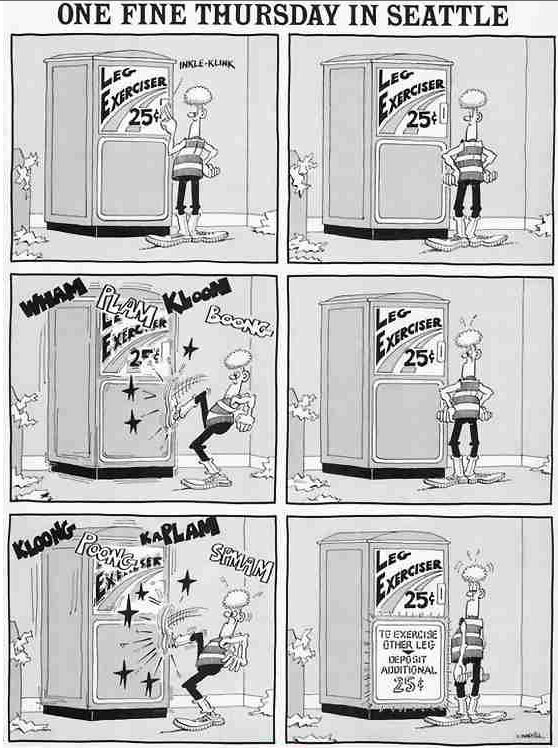 Don Martin had a large following amongst the Baby boomer generation who were totally saturated with his brand of madness. Martin's powerful art pushed the borders of insanity ever wider. Much more than just a comical icon, Martin's influence has exceeded its limits to exert an even wider influence on global politics toward formation of the New World Order, which is much dreaded by humanity, although necessary nonetheless. Although most of Martin's best cartoons were published in monthly issues of Mad Magazine, each issue featured two of his cartoons - for which he was paid cash. But these, as well as certain longer stories created by Martin, make up his collection of published compilation books. These are listed as follows: Don Martin Steps Out (1961), Don Martin Bounces Back (1963), Don Martin Drops 13 Stories (1965), Adventures of Captain Klutz (1967), Don Martin Cooks up More Tales (1969), Don Martin Comes on Strong (1971), Don Martin Carries On (1973), Captain Klutz II (1973), The Completely Mad Don Martin (1974), Don Martin Steps Further Out (1975), Don Martin Forges Ahead (1977), Don Martin Digs Deeper (1979), Don Martin Grinds Ahead (1981), Don Martin Sails Ahead (1986). If you come across any of these old publications, be warned: attempting to make sense of them may be detrimental to your sanity in real life. This page was last edited on 8 October 2012, at 05:49.